A new horned dinosaur, Wendiceratops Pinhornensis, was discovered based on fossils collected in Southern Alberta Canada. Around 200 bones discovered in the Canadian bone bed represented at least four of these dinosaur species. The new species of dinosaur, which lived during the late Cretaceous period around 79 million years ago, is around 20 feet long and weighed more than a ton. The dinosaur had a series of forward-curling hook-like horns along the margin of the wide and a shield-like frill that projects from the back of its skull. It also had a large, upright horn on the nose and although there were no bones discovered to prove this, the scientists believe that there were horns over the eyes as well (The dinosaur on exhibit at the Royal Ontario Museum had reconstructed horns over the eyes; see image below). Because of these horned features, the Wendiceratops is one of the most striking horned dinosaurs ever found. The dinosaur is named after renowned fossil hunter Wendy Sloboda, who discovered the site in 2010. Scientists have discovered a striking new species of horned dinosaur (ceratopsian) based on fossils collected from a bone bed in southern Alberta, Canada. Wendiceratops (WEN-dee-SARE-ah-TOPS) pinhornensis was approximately 6 meters (20 feet) long and weighed more than a ton. 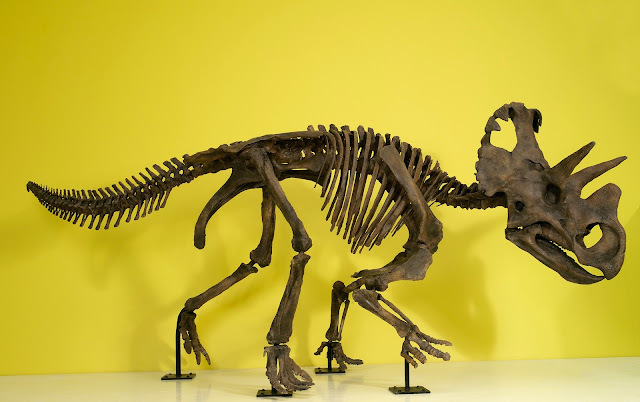 It lived about 79 million years ago, making it one of the oldest known members of the family of large-bodied horned dinosaurs that includes the famous Triceratops, the Ceratopsidae. Research describing the new species is published online in the open access journal, PLOS ONE. The new dinosaur, named Wendiceratops pinhornensis, is described from over 200 bones representing the remains of at least four individuals (three adults and one juvenile) collected from a bonebed in the Oldman Formation of southern Alberta, near the border with Montana, USA. It was a herbivore, and would crop low-lying plants with a parrot-like beak, and slice them up with dozens of leaf-shaped teeth. Wendiceratops had a fantastically adorned skull, particularly for an early member of the horned dinosaur family. Its most distinctive feature is a series of forward-curling hook-like horns along the margin of the wide, shield-like frill that projects from the back of its skull. The new find ranks among other recent discoveries in having some of the most spectacular skull ornamentation in the horned dinosaur group. "Wendiceratops helps us understand the early evolution of skull ornamentation in an iconic group of dinosaurs characterized by their horned faces," said Dr. David Evans, Temerty Chair and Curator of Vertebrate Palaeontology at the Royal Ontario Museum in Toronto, Canada, and co-author of the study. "The wide frill of Wendiceratops is ringed by numerous curled horns, the nose had a large, upright horn, and it's likely there were horns over the eyes too. The number of gnarly frill projections and horns makes it one of the most striking horned dinosaurs ever found." The horn on the nose is the most interesting feature of Wendiceratops. Although the nasal bone is represented by fragmentary specimens and its complete shape is unknown, it is clear that it supported a prominent, upright nasal horncore. This represents the earliest documented occurrence of a tall nose horn in Ceratopsia. Not only does it tell scientists when the nose horn evolved, the research reveals that an enlarged conical nasal horn evolved at least twice in the horned dinosaur family, once in the short-frilled Centrosaurinae group that includes Wendiceratops, and again in the long-frilled Chasmosaurinae group which includes Triceratops. A nose horn has been generally thought to characterize Ceratopsidae, and be present in their common ancestor. "Beyond its odd, hook-like frill, Wendiceratops has a unique horn ornamentation above its nose that shows the intermediate evolutionary development between low, rounded forms of the earliest horned dinosaurs and the large, tall horns of Styracosaurus, and its relatives," said Dr. Michael Ryan, Curator of Vertebrate Paleontology at the Cleveland Museum of Natural History, and co-author of the study. "The locked horns of two Wendiceratops could have been used in combat between males to gain access to territory or females." The recognition of Wendiceratops affirms a high diversity of ceratopsids likely associated with a rapid evolutionary radiation in the group. It also helps document high faunal turnover rates of ceratopsid taxa early in their evolution, coupled with some degree of ecological niche partitioning during this time. The name Wendiceratops (Wendi + ceratops) means "Wendy's horned-face", and celebrates renowned Alberta fossil hunter Wendy Sloboda, who discovered the site in 2010. This is a well-deserved honor for Sloboda, who has discovered hundreds of important fossils in the last three decades, including several new species. "Wendy Sloboda has a sixth sense for discovering important fossils. She is easily one of the very best dinosaur hunters in the world," said Evans. This dinosaur is the latest in a series of new finds being made by Evans and Ryan as part of their Southern Alberta Dinosaur Project, which is designed to fill in gaps in our knowledge of Late Cretaceous dinosaurs in North America and study their evolution. This project focuses on the paleontology of some of oldest dinosaur-bearing rocks in Alberta, as well as rocks of neighboring Montana that are of the same age. 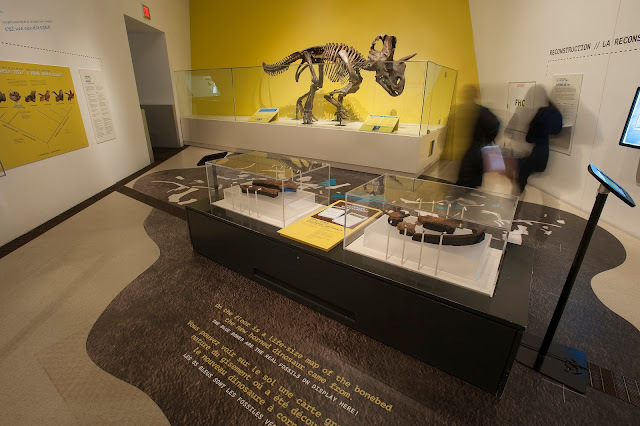 A full-sized skeleton and exhibit profiling Wendiceratops is currently on display at the Royal Ontario Museum in Toronto, and the dig uncovering it appeared in the HISTORY Channel documentary series Dino Hunt Canada.